Apartment is located in the historic center of Saint-Petersburg. There are 2 isolated bedrooms and livingroom joined to the kitchen. Apartment accomodates up to 6 people (2+2+2). It is suitable for big families. 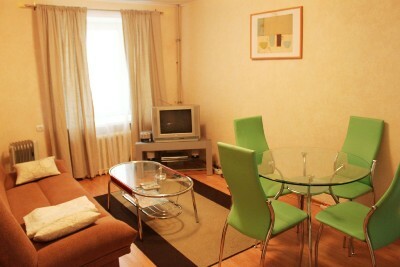 In apartment you will find everything you need: microwave oven, electric kettle, gas stove, bed linen, Tv etc. Apartment is located very close to the main places of interest of Saint-Petersburg, among them: State Russion museum, The Hermitage, Mihailovsky theater, Anichkov palace. It takes only 5 minute to get to the metro (Mayakovskaya or Gostiniy dvor).